The first one is very Escher-esque. Do they cross? Are they infinite stair cases? 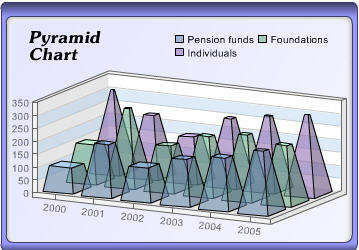 If you take a closer look at the company’s web site you will notice other versions of the same charts without the special effects. I know it is easier to ignore this if you are just trying to be evil, which I am sure this is not where you are going. We all know – simple is beautiful. We also know that most data viz packages offer different rendering styles and are quite good at allowing us to customize the way data is presented. New comers have to stand-out. This is why they try to show-off with sfx, flashy graphics etc. There is nothing wrong with that. As an architect I know how to look beyond that. I examine the package’s architecture and technology. This is where new software packages often surpass their ancient, monolith counterparts such as Hyperion and Cognos. 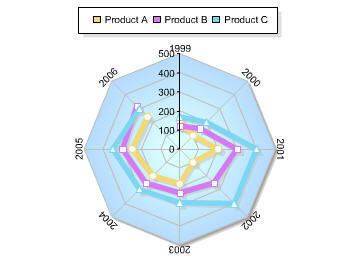 Do you feel that it is appropriate for a software vendor to promote charts that present data ineffectively? As I mentioned in my blog, not all of the charts in WebCharts 3D exhibit the transparency feature, and even a few avoid the problem of 3-D rendering. The examples that they feature — those that they promote the most – however, all seem to exhibit these problems. As a customer, would you buy a product that did so much so poorly, even if there were a few items that could be made to work adequately? Would you trust a vendor that demonstrated such disregard for designs that actually work? From your comment about overlooking the problems and examining the product’s architecture and technology, I would guess that you’re an engineer. Perhaps as an engineer with a focus on technology, you are missing what’s most important about a charting product, which is its ability to communicate information. 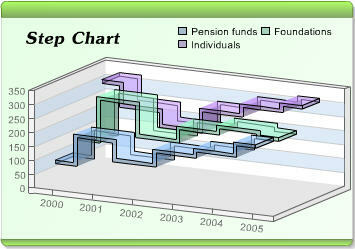 Even the charts that are not transparent or 3D are poorly designed and thus fall short. In my original blog entry above, I’ve added a picture of every one of the Step Charts that appear in the WebCharts3D gallery. This will provide readers with the means to more broadly assess the quality of this product. No one who understands and cares about graphical communication would use any of these in their current form. Regarding my role as a data visualization professional, I have the responsibility to tell the truth about what works and what doesn’t, which I do about all products and companies that I encounter, whether they are my customers or not. If you were familiar with my work, you would know that I critique and often speak the uncompromising truth in my articles, books, and courses about many of the vendors that have been my clients, including Hyperion and Cognos, who you mentioned above. It isn’t nice to question someone’s professional integrity without knowing the facts. Ryan, in fairness to Stephen, if you look in his latest book, and on this website, you will see examples of many vendors who make the same mistakes. Why not take up the challenge? Demonstrate how your software can be used to produce the “good stuff” not the “sfx”. I’m sorry Ryan, there isn’t much room to defend this stuff on information visualization grounds. This highlights the differences in priorities. Apparently a lot of charts and easy install is sufficient to attract the attention of this technology crowd. Stephen, I am a big fan of your books and approach to dashboard design. As a manager of dashboard development and design your books have become valuable guide that enables me to bring business value. 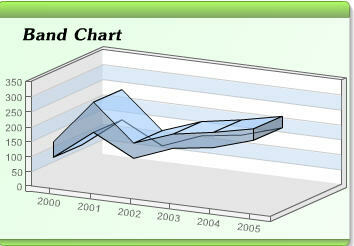 And we use Webcharts to generate our graphics. 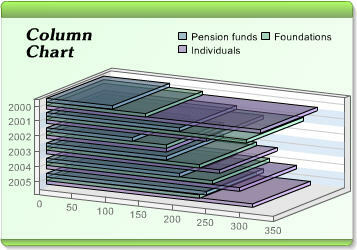 To be fair, I believe 3D charts are always confusing and difficult to read. I have not personally seen a single situation where the flashy transperent 3D graph out performs a simple presentation of the data. That said, WebCharts3D provides me with a good selection of simple charts and graphs that enable me to produce a good quality product. The design of the software allows me to develop server side graphics that are light weight and render quickly in all browsers. It is a good performing software package and I think that is what Ryan was trying to communicate.